We found ourselves busier than we anticipated this spring heading into the summer months. It was a good kind of busyness. We are thankful for so many opportunities God has graced us with. Opportunities to share the Gospel with many young people of Eastern Europe. We are thankful for the opportunities that God has given us to live out our faith in gratitude for the gift of salvation He has given us through the blood of Jesus Christ. We often dwell on the here and now of our earthly lives and spend little time looking towards our heavenly home. I hope this year through the work of the Holy Spirit we were able to plant seeds in lives and hearts of many young people that this life is but temporary, as we look towards our glorious future of everlasting life, dwelling with and praising God. We hope and pray that the words and deeds that were heard and observed by many young people in our English lessons and clubs, Bible Retreats, and other ministries point towards our precious hope that is in Christ alone. The focus of these latest blogs, although belated, has been upon spring events. In our next blogs we will give a report on our summer camps which the LORD blessed immensely. With thankful hearts and humble praises, Soli Deo Gloria. I never got around to posting a blog I wrote last spring about the beauty of spring in Ukraine. I thought it was still worth posting. Spring abounds with hope and renewal. The changing of the season passes by, giving hope of new life and a renewed creation. As beautiful as the winter is, what a glorious transformation to watch the snow melt and to see the wonder of life and color return after the dormant sleepy months of winter. Life in the villages of Ukraine with the spring season come to life in buzzing activity following months of house bound winter captivity. Ukraine will never have spring time fame like the flower fields of Holland, or the cherry trees blossoming in Washington D.C. or Tokyo. Yet, with an abundance of fruit trees joined by a variety of flowers perfectly suited for life and growth here, Transcarpathia, Ukraine, lacks nothing in beauty during the spring time months. 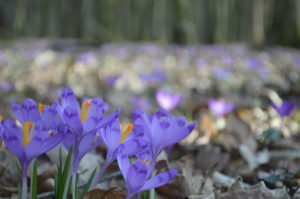 The snow flowers are the first to appear, often before the snow even melts away, soon followed by the Crocus covering the forest floor in a majestic sea of purple. These early spring flowers are soon replaced by tulips, fruit tree blossoms, and many other flowers too numerous to name here. Spring is my favorite season in Ukraine. All of creation in every season testifies of God and proclaims His name and His handiwork. The coming to life of creation in the spring time reminds me of God’s promise of a New Heaven and a New Earth. What a glories day it will be to see God’s perfect creation where there will be no more pain and suffering or death, and every tear will be wiped away.